Because of the importance of email it is important to many that they are notified when new email arrives. However internet email is a request based system which means that to get new emails you must request them from the email server. However to avoid having to manually check for new email, email clients like Windows live mail will do this automatically. The default for most clients is 15 minutes. You can change this to a lower setting if you wish. When new email arrives you are alerted by a visual notification (usually) in the task bar. You can also be alerted by a sound notification. 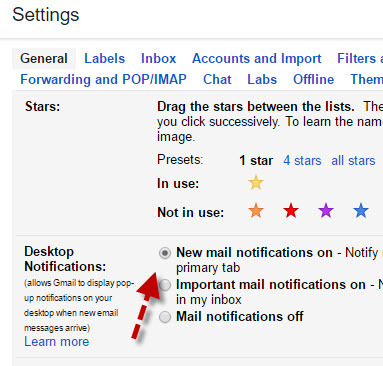 You will need to enable sound notifications on the email client and this setting is also shown in the screen shot above. 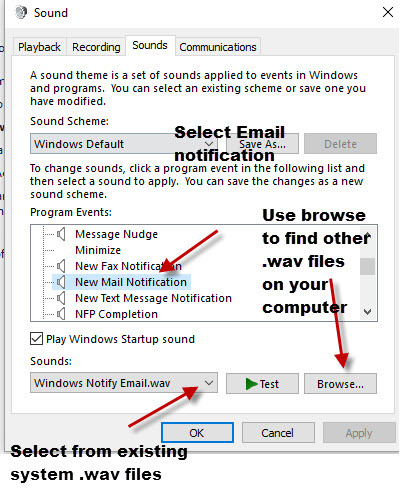 Windows will associate a default sound for new email notifications. 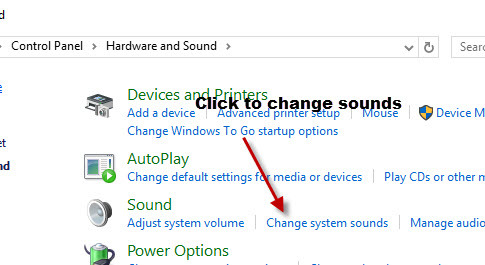 You can change this in the Windows system settings. Open Control panel –using the search box type control Panel and select control panel from the suggested Apps. Click on the sounds tab and from the ‘sound events’ list choose an event use the scroll bar to locate the new mail notification. Then either browse to locate a new wav file to associate with it, or use the drop down arrow under sounds to select from the existing system sounds. 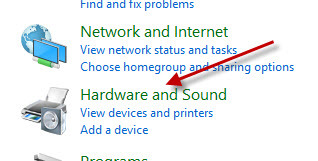 For Windows Live Mail and Outlook Express clients sounds work OK on Wndows 7 and below. With Windows Live Mail on windows 10 and I assume windows 8 new email sound notifications work, but they seem to always use the default sound. Your email client must be open for sound notifications to work (windows 7 and below, and old mail clients like windows live mail)- you can minimise it so that it shows as an icon on the taskbar . If you used a web browser as your main email client then until recently email notifications wasn’t possible without some form of add-on. However Gmail, and Yahoo Mail now support new email notifications using the Websockets protocol. You may have noticed this as when logging into your email account you may have been prompted to enable new email notifications. When a new email arrives you should see an alert in the bottom right of your screen. Again your web browser must be open and connected to your email account. Notifications of all kinds are common on smart phones and tablets and email notifications are part of the notification system. Provided that you have not disabled notifications and email notifications are enabled for the email account (default) then you will receive a notification even when the email client is closed. Because windows 10 is designed for both PCs and tablets the notification system works like that on android and IOS tablets. If you use the Mail client that comes with Windows 10 and enable mail notifications you will receive new email notifications even when the mail client isn’t open.